Instead of what Whole Foods calls “Chickens Raised with Care,” investigators found starving, debeaked hens and roosters covered in feces and crowded miserably in a dark shed thick with pollution. 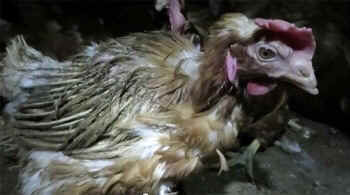 In the video, amid the horror, we watch as an investigator gently gathers up one little hen who lies dying in the manure. This hen, whom they name Mei Hua, meaning Beautiful Flower, lived to experience grass and fresh air for the first time in her life. But for the others, there was no way out. EDITOR: I’m grateful that brave activists are shining a much-needed light on the dark and secretive world of animal agriculture in Sonoma County. This is not just a case of one bad egg. 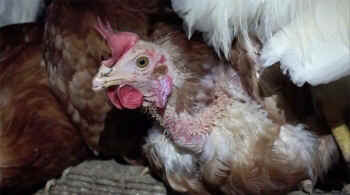 Cruelties are inherent to breeding animals for meat, dairy and eggs, no matter the label. Mothers are separated from frightened newborns, agency is denied, and the brutal slaughter of young animals who want to continue living is inevitable. The owner’s defense was that the hens in the video were not from their “certified humane” flock but from the conventional buildings they have on the property. So let me get this straight — the Mahrts [the owners] are OK with having some of the birds suffer, as long as they are not the certified humane hens? If the owners truly cared about the birds, they would have the highest standard for them all, but it’s about running a business, and they can make more profit with a wider variety of products. It’s unnecessary and unhealthy to eat animal products and impossible to honestly farm animals humanely. Let’s embrace a new ethic. Bring farmed animals into our circle of compassion and not eat meat, dairy or eggs. 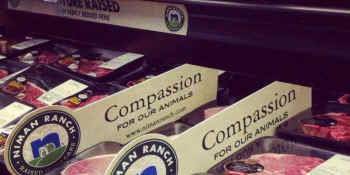 "Certified Humane is a LIE. Please care about me. Chose compassion. Be vegan." Direct Action Everywhere activist Brian Burns will discuss DxE’s philosophy and strategies at UPC's Fourth Annual Conscious Eating Conference in Berkeley, CA Saturday April 4 cohosted by Animal Place. Registration is now open – please join us!